Our sweet angel Emily is one precious young lady. 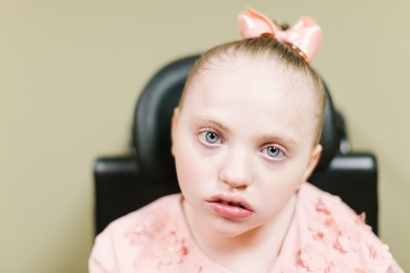 Miss Emily has a number of special physical and developmental needs and resides at Arkansas Pediatric Facility. She receives excellent care from her team there, and it is likely that she will need to live there for the foreseeable future to continue meeting her special needs. She is non-verbal and spends most of her time either in her wheelchair or in her super-cool, fancy bed. But she loves music, and her beautiful face just lights up when her favorite songs come on. Emily has an incredible spark and a warmth to her that is just hard to describe, but you know it as soon as you spend any time with her. She is an amazing young lady, and she deserves to know that her family is right there beside her as she continues with her therapies and care, celebrating milestones and accomplishments and every little thing along the way. If you’d like to be a part of Emily’s life, please let us know.